Life is a patchwork of separate experiences that come together into a unified whole, much like a handmade quilt. I am happy that you found my blog. Welcome to my blog! Handmade bunting is an unique and beautiful home decor for different occasion. It’s not too difficult to make them either. The most important part is to choose matching fabric. It works best if the fabric is patterned with small flowers, shapes, squares and lines. I only use cotton fabric, which I wash in 40 degrees C beforehand. 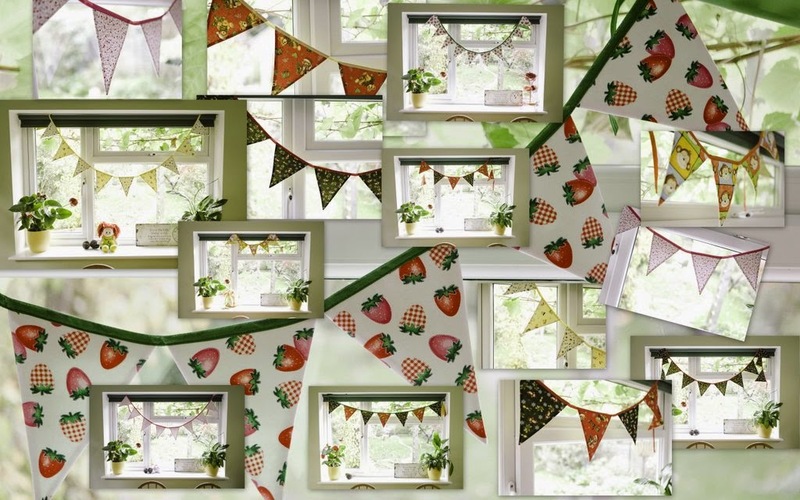 The bunting can be done double sided, which means that can be hung from one side of the room to another and admired from all angles. It’s up to you what size flags you will choose to make and how many of them. During one of my visits to the UK I’ve noticed cheerful banners in some shop windows and market’s stalls. I don’t know if they originate from England and I don’t know why I haven’t noticed them before. After seeing them I thought that I could make one for my granddaughter's bedroom and went straight to the local sewing shop to find some fabric. It was difficult to choose, because the choice of fabric and materials was vast, but in the end I bought a cheeky monkey fabric in bright colors. The theme matches both the decor of my granddaughter's bedroom and her cheekiness at the moment. Pineapple quilt blocks like Log Cabin quilt, are built around a center square, but instead of just four logs, every round now contains an additional four patches. This is one of two Pineapple quilt block cushions. The inspiration for making them came after the birth of two of my grandchildren а few months apart. I made both cushions in no time. It wasn’t a difficult task. For the middle square I choose a fabric with a heart symbol, expressing my love to the children. I like to experiment. Here is the completed heart patterned cushion. Variation in red and white.